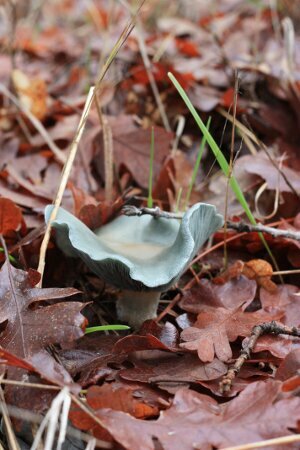 Anise Scented Mushroom (Clitocybe odora), a prized edible native fungi found throughout Herland Forest. Last night I had the opportunity to see fungi expert and all around visionary Paul Stamets give a presentation at the Provender Alliance conference in Hood River, Oregon. In many ways it is through the work of Paul that we have come to the position that protecting, enhancing and studying the habitat and life cycles of regional fungi and their associates is critically important to understanding the overall ecological cycles of Herland Forest. In his presentation, Paul articulated his ongoing research into the power of mushrooms to aid us in the ecological crisis that is facing the planet. He points out that we are in the 6th major extinction event in the History of Earth. And the loss of biodiversity is the direct result of the human impact on this planet. He points our as well that during all other extinction events, the ones who survived an thrived in the ensuing darkness and climatic chaos were Fungi. He also pointed out some amazing research his company, Fungi Perfecti, is doing along with medical establishments on the power of mushrooms to prevent and fight cancer, stabilize immune system function, fight pathogenic bacteria such as S. Aureus and E. Coli., and so much more. Wow! what an inspiring kingdom of life. and what a body of knowledge this man has. The evenings talk has lead me to wonder about what we can do to partner with Fungi for our mutual health and well being, and the well being of the planet. Paul put out a call to preserve and protect the old growth habitat of the Pacific Northwest. Although Herland Forest is second-growth forest, and is in a drier eco-type than the rain forests of the Western Cascades, we can still host our own native Fungi in our forests. The above video of Paul Stamets at the Bioneers Conference talking about ways in which Fungi can help regenerate land and detoxify the environment. Lindsay and I had the opportunity to talk with his for a few minutes after his presentation about the nature of the mycological research component of Herland Forest. He pointed us in the direction of some forensic graveyards that will have a body of knowledge about the role of fungi in decomposition. We also desire to partner with local mycological groups who can help us identify the fungi that we have onsite. In this way, we hope to develop manage practices for the cemetery that create a home for Fungi. In closing, here iss a statement made by Paul on Fungi.com that is at the core of our ecological goals with Herland Forest. A civilization the denies death ends by denying life.